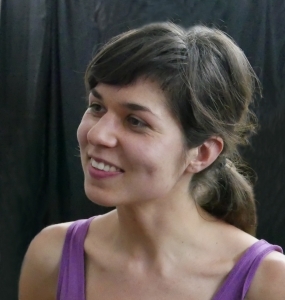 Jana Bitterová is a dance artist, choreographer, improviser and creative movement facilitator. Originally from Prague, she became a traveling artist working worldwide. She has been based in Cornwall, UK (assisting and teaching at Falmouth University), in Quimper, France (assistant in choreographic structure T.E.E.M. ), in Oostende, Belgium (in educational department for Mu.ZEE), in Bratislava, Slovakia (student of Academy of Performing Arts) and she regularly returns to her homeland, the Czech Republic, to run various projects and deliver workshops. As a choreographer and performer, she creates solo performances and participates in interdisciplinary projects with musicians, visual artists and digital media artists. She collaborates with Ian Biscoe in productions of multimedia projects connecting dance and digital technologies. She is a member of Free Three improvisational company. One of her main interests lies in Contact improvisation, facilitating classes and jams across Europe (Contact Festival Freiburg 2017, Wednesday CI Jams at Falmouth University 2016, a founder of Bratislava Contact Improvisation 2015). She enjoys introducing dance to people of all levels of experience and age (e.g. choreographic projects in primary schools organised by SE.S.TA.). Jana studied for her Masters degree in Pedagogy of Contemporary Dance at the Academy of Performing Arts in Bratislava, Slovakia, under Anna Sedlačková (a dance and Body-Mind Centering Practitioner) and Marta Poláková (a Laban Movement Analyst). Subsequently, she had an opportunity to meet in studios personalities of postmodern dance and improvisation such as Nancy Stark Smith, Lisa Nelson, Daniel Lepkoff, Ruth Zaporah, Julyen Hamilton, Stephanie Skura, K. J. Holmes, Malcolm Manning, Frey Faust and others. Their propositions are important sources of inspiration for her work.